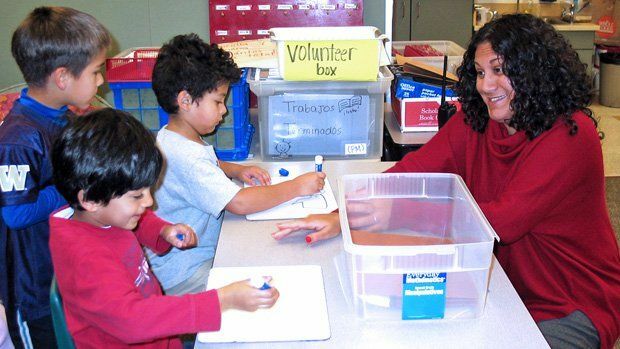 Educators from John Stanford International School in Seattle, Washington, have provided these resources and tools for teaching global competence. At John Stanford International School, principal Jesely Alvarez says that they're not "just teaching our students about the world, we're asking them, 'What are you going to do about it?' It's about taking action. Sample global competence unit plans for various grade levels provided by Seattle Public Schools. Each unit contains state standards, global perspective, essential questions, timetable for the unit, and student and teacher goals. Unit Plan - Unit exploring Northwest Coast First People through legends and art. Students will begin building background knowledge in the library by reading nonfiction books and examining websites. Unit Plan - Unit exploring world religions and festivals of light celebrated around the world. Through this unit students learn tolerance of other cultures and religion. Unit Plan - Unit on the internment of American citizens and residents of Japanese ancestry during World War II. Students will compare the Japanese internment to other examples of internment around the world. Unit Plan - Unit plan on the iEARN project, connecting math to our daily lives. Students learn rates, proportions, percent, problem-solving, and communication as tools of analysis in a meaningful global context. Unit Plan - Unit on writing a research-based argument essay. Students will learn about child soldiers around the world and investigate how the United States participates in this issue. Students write arguments to support claims with clear reasons and relevant evidence, using accurate credible sources and demonstrating an understanding of the topic or text. Unit Plan - Unit on climate change where students read about indigenous points of view on climate change and have a mini summit where they will come up with action items. Students learn perspectives on climate change and how climate change affects people around the world. Unit Plan - Unit on migration and industrialization from 1870 to 1900. Students will recognize and understand how migration and industrialization transformed the US and brought about cultural and economic change to nations around the world. The first annual International School Symposium was held in March of 2012 in Seattle, WA. All eight of the international schools from Seattle Public Schools convened to collaborate and work on Cultural and Global Competency. All of the 500+ staff and administrators did a book study on Preparing Our Youth to Engage the World by Veronica Boix Mansilla and Tony Jackson. Some of the Teacher Leaders were instructed to share student work and unit plans (see above) to help facilitate some of the breakout sessions. The teacher leaders were selected by their principals as teachers who are respected by their colleagues and who embed the seven components of international education into their teaching. International Symposium Document - Overview handout from the International School Symposium held March 16th, 2012, in Seattle, WA. This document includes the agenda, purpose, outcome, information on the keynote speaker, and blank templates used for the breakout sessions. Preparing Our Youth to Engage the World Excerpt - Excerpt from Veronica Boix Mansilla and Tony Jackson's book. Excerpt includes checklist for teaching global competence, investigating the world, recognizing perspectives, communicating ideas, and how to take action. Learning Walk Feedback Form - The principal at JSIS takes learning walks to observe teachers in the classroom and uses this form as a teaching component for professional development. It includes planning and preparation, classroom environment, instruction, and professional responsibilities. Weekly Letter Example - At JSIS the principal sends out a weekly letter to staff; in this sample letter she describes what she's looking for during classroom observations.